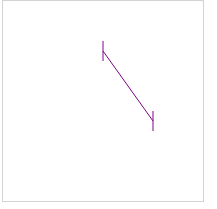 I'm using HTML canvas to draw Line as shown in the following figure, but this line has an edges on the two sides of it. As shown in the image the two edges are not perpendicular to the major line. * find the angle of the major line and then draw the lines with respect to the line, but this solution was not easy to implement (most likely i implement it wrongly). can anyone help me with rotating the two edges lines in order to become perpendicular to the major line. Perpendicular lines are simple to get if you remember the rotate 90 deg rule for a vector. // draw line the start cap and end cap. Simple solution to rendering content along a line, Uses the same 90deg rule. There is an alternative method of rendering using the same vector rotation, but rather than set the perpendicular axis via vector multiplication, you set the y axis of the transform to 90deg from the x axis which is along the line. Set the origin to the start of the line and you simply render relative to the line. // start of line. y Axis is rotated clockwise 90 from the line. // using the method saving some time. This example show how to use the transform to do the same line but add annotated length as well.